Socket, Hexagon | 12.5 mm (1/2") Drive | 36 mm -2936 - BGS technic. Impact Socket, 12-point | 12.5 mm (1/2") drive | 38 mm, 5344- BGS technic. Socket, Hexagon | 20 mm (3/4") Drive | 32 mm-3432-BGS technic. Вложка ударна RIBE M7, дължина 75 мм 1/2"
Вложка удaрна RIBE M9, дължина 75 мм 1/2"
Impact Bit Socket, Spline, M4, 1/2"
Вложка удaрна RIBE M5, дължина 75 мм 1/2"
Вложка удaрна RIBE M6, дължина 75 мм 1/2"
Radiator Spud Wrench, 1/2", five steps, ZR-17RSW01 - ZIMBER TOOLS. Bit Socket | length 100 mm | 12.5 mm (1/2") Drive | T-Star (for Torx) T70 (4477) - BGS technic. 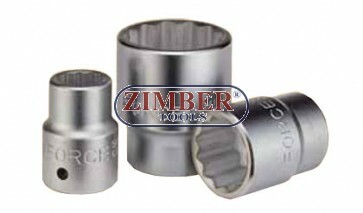 Impact Bit Socket, Ribe, M14, 1/2"
Socket 1/2 for Mercedes-Benz M-Class, ZR-36CW20 - ZIMBER TOOLS.